Today is June 4 and Queen Jetsun Pema of Bhutan celebrates her 28th birthday. 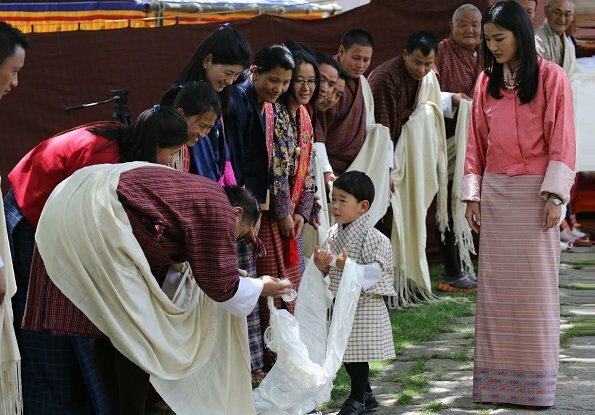 On the occasion of that birthday, representatives from the Taxi Tshogpa, Centenary Farmers' Market, National Veterinary Hospital, and health services personnel presented the Tashi Khadar (traditional white silken scarf) to the Queen at the Lingkana Palace. Always when I see pics from the Royal Family of Buthan, I want to buy a ticket and go there. Maybe next year! Beautiful lady, such a cute little boy. Wish there were more pics. Quite a subdued color palette on the queen here -- and a very pretty one! The little prince looks just like his dad. The little Prince really takes after his father the King. Her Majesty is a real beauty but so serious...may be buthanese protocol the reason why she doesn't smile? The Queen looks very lovely the pink color matches well with her hair.This little boy is the cutest. Je craque à chaque fois. Le petit prince est toujours aussi adorable.